In New England, we are in a perpetual state of suspense once Punxatawney Phil peaks his furry little head out of a Pennsylvania hole at the beginning of February. We sit at the edge of our seats, always hoping for the mercury to ascend past the 50 degree mark, never feeling completely safe from the threat of a spontaneous snowstorm. The creation of this cake was akin to an anti-rain dance. If we build a spring-like dish, it will come. Soon. 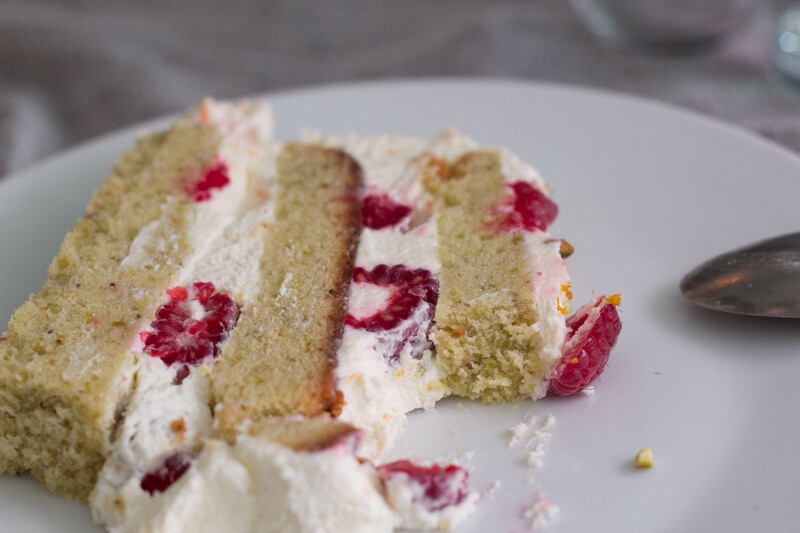 If you’re in need of a sweet something for an early spring birthday, or to sympathetically celebrate a late winter baby who has always wished for a warmer weather DOB, this cake is packed with what we would refer to as “bright” flavors: lemon, raspberry, fluffy. And yes, we do consider “fluffy” to be a flavor in our house. 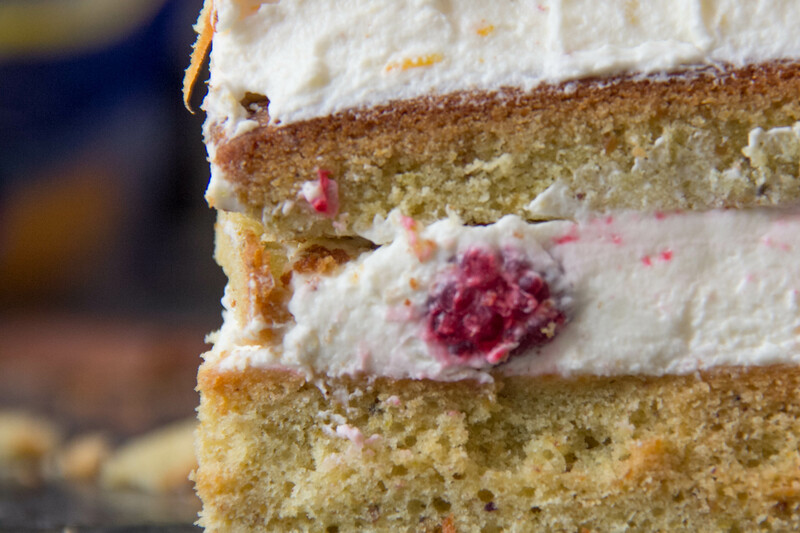 The base of the cake is a traditional pound variety – equal parts for most ingredients. In an earlier version of the recipe, I attempted to substitute a significant portion of the cake flour for ground pistachio in a pseudo gluten-light iteration. I do not recommend doing this EVER. Ground pistachio is considerably oily, and the resulting cake, once cooled, tasted like a day-old overfried pistachio hush-puppy. (Hmm…pistachio hush puppies…there’s a thought). Nevertheless – not welcome here. 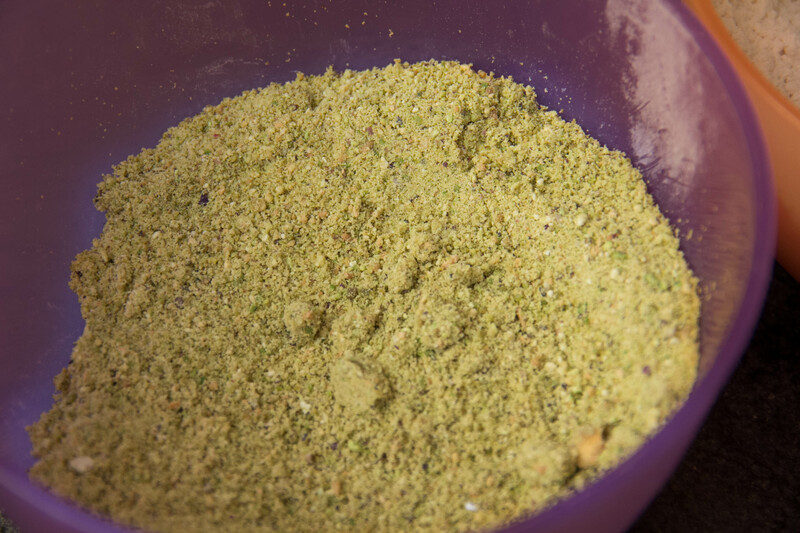 In the end, the winning recipe employs equal parts flour and ground pistachio. This balances the natural oils for a dense, perfectly moist pound cake with a really robust pistachio flavor profile (that doesn’t feel as if it’s spent a day soaking in the fryolator. That’s not nice.) 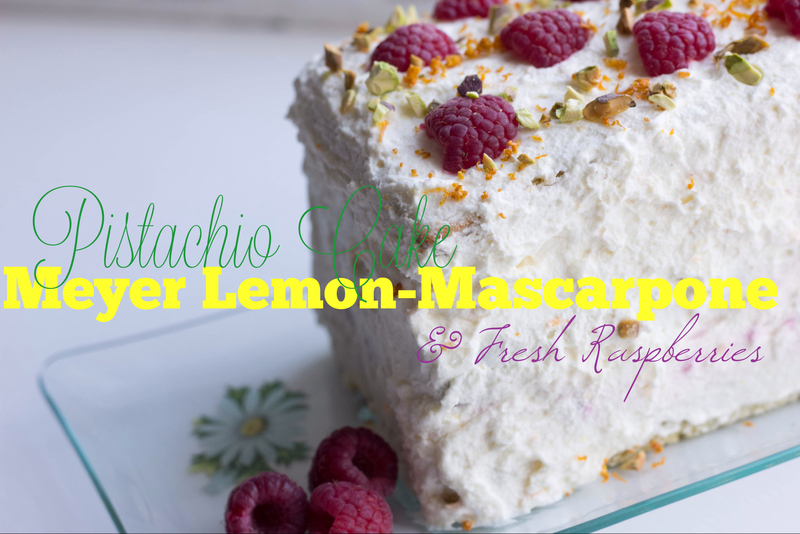 The mascarpone provides a sharp tartness that compliments the sweet, seasonal lemons, and the cottony frosting is a nice foil for the weighty cake. 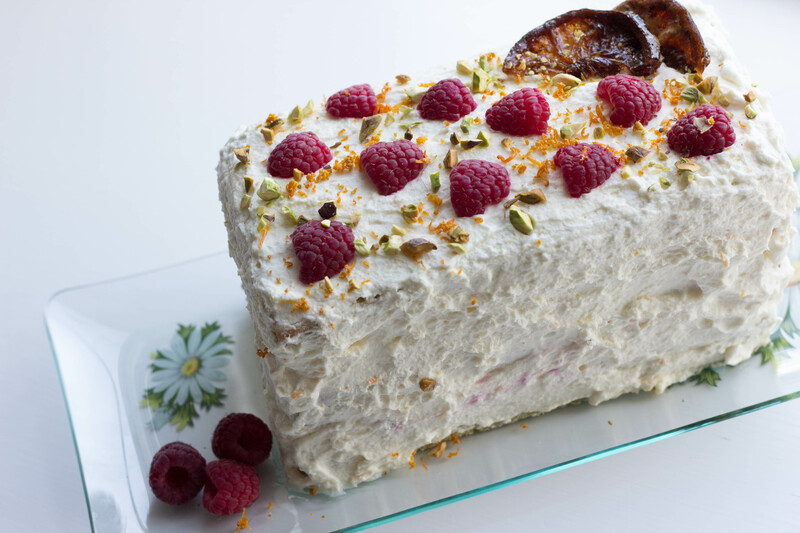 A few fresh red raspberries sandwiched in between layers are texturally pleasant, and they happen to be old friends of the pistachio as well. A full bite that grabs a little of everything – you know the kind, that perfect bite – really demonstrates how much the major components enjoy each other’s company. I’m absolutely planning on pounding this one out again when the weather is even warmer and we all need a place to stash the freshly picked fruits of the season. I should warn you though, in the interest of full disclosure, not two days after the baking of this cake our front lawn got a frosting of its own – 6 inches of fresh powder. We enjoyed the leftovers of our first taste of spring after digging out the driveway…hopefully for the final time. Pistachio Pound Cake: 1 Cup of Sugar 2 Sticks Slow Churned Butter 4 Eggs 1 Cup Cake Flour 1 Cup Ground Pistachios 1 Tsp Salt Preheat oven to 325 Degrees. Sift together flour & salt and set aside. Cream together the butter and sugar until light and fluffy (3 – 5 minutes) with an electric hand or stand mixer. Add eggs, one at a time until well integrated. Beat in the flour mixture slowly, followed by ground pistachios. Once the mixture is combined well, bake for 1 hour. Meyer Lemon Mascarpone Frosting: 1 Cup Heavy Cream 1 Cup Mascarpone 3/4 Cup Powdered Sugar Juice & Zest of 2 Meyer Lemons (set aside a sprinkling for garnish) 1 Cup Raspberries (set aside a handful for garnish) Combine heavy cream, mascarpone, lemon juice & zest, and powdered sugar in a bowl. Beat until well mixed and fluffy with an electric or stand mixer. Gently fold in the fresh raspberries. 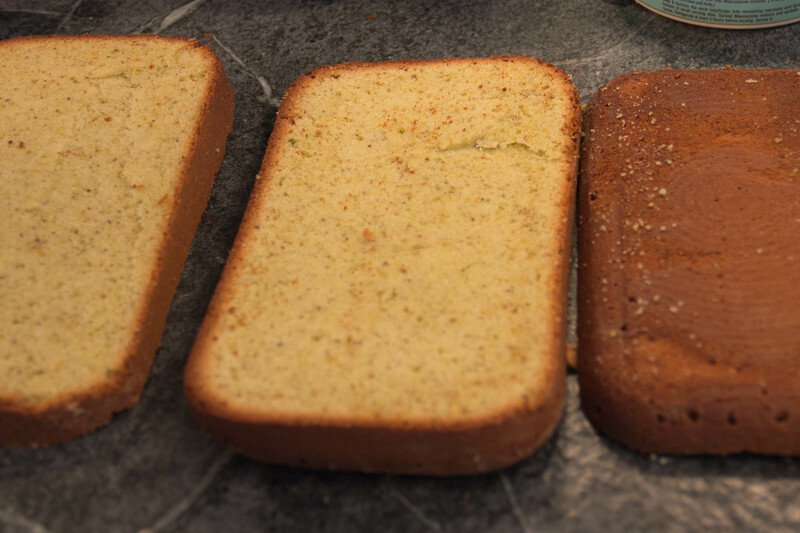 To assemble, slice the pound cake loaf lengthwise into three planes, trimming the sides for uniformity. 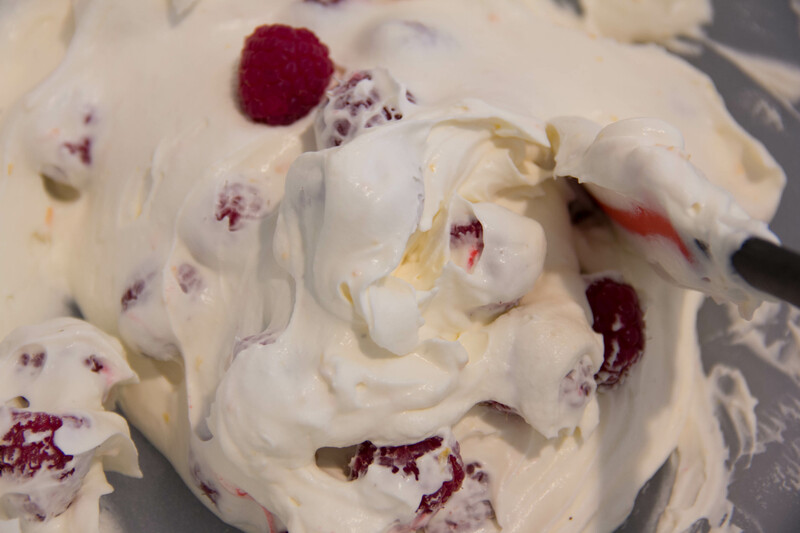 Set aside one cup of the frosting for the top and sides, and mix the raspberries into the remaining mixture (saving 4 or 5 for garnish). 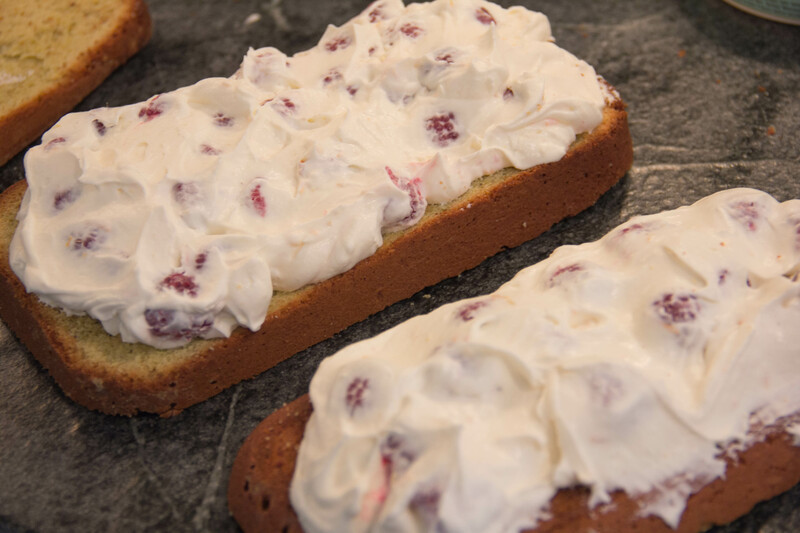 Once the fruit has been gently folded into the frosting, evenly distribute over the first two layers and stack, as shown. Once the top layer is in place, proceed to frosting the entire cake with the rationed cup. 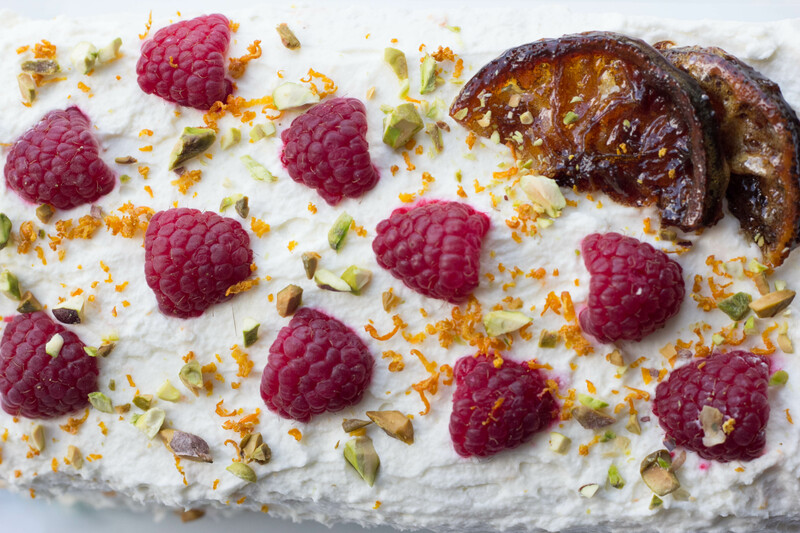 Garnish with halved raspberries, Meyer lemon zest, and roughly chopped pistachios. I candied a few lemon slices at the last minute; they really aren’t critical but they add a little something if you have the time to spare.